← George Soros Shops at Target: The Boycott Bit the Dust! During the Republican presidential debates on Wednesday evening hosted by that paragon of journalistic integrity known as MSNBC, viewers were treated to the occasional big-government-is-best pitch proffered by the network’s progressive Talking Heads. And the best of the bunch for a belly laugh or two featured the very Left-leaning liberal lesbian, Rachel Maddow, who was holding court at the Hoover Dam. Yep, the Hoover Dam. 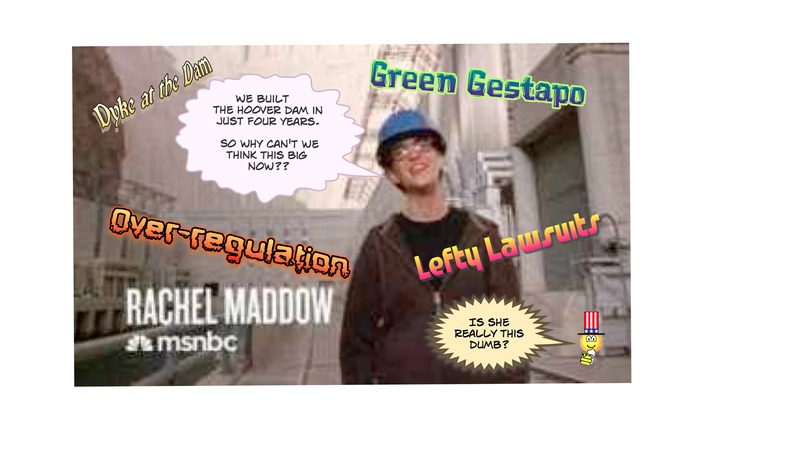 Duly fitted out in a working stiff’s Blue-State hardhat and sporting casual dress-down proletariat attire, Ms. Maddow attempted to remind the commoners just how great it was when big government got to do such great big things and she urged her fellow citizens to start thinking real big once again. Just lean forward, America, and not to worry, your progressive betters at MSNBC will be there to catch you. But as Jonah Goldberg pointed out yesterday in his article over at Real Clear Politics, Ms. Maddow is so steeped in her own hypocrisy that she doesn’t seem to understand that more than a few decades have come and gone since the great Hoover Dam was constructed. And those years have brought with them layer upon layer of liberal governmental bureaucracy and regulations not to mention the numerous Left-wing activist groups and their save-the-earth constituencies all foaming at the mouth over any and every public works project. What silly naivete and pathetic progressive posturing. My gosh, Maddow really is a dime store dope. This entry was posted in Media/Arts/Entertainment, Political/Social and tagged Hoover Dam, Lean Forward, liberal lesbian, msnbc, Rachel Maddow. Bookmark the permalink.